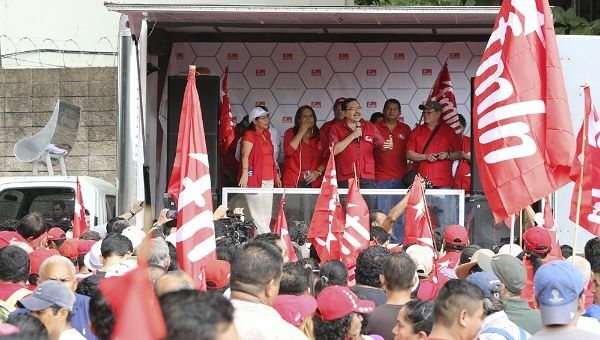 FMLN leader and Legislative Assembly president Lorena Pena told Prensa Latina that the party, now that it is governing, needed to update its objectives. The FMLN used to have a grassroots revolutionary war strategy until signing peace agreements in 1992. It then turned to seeking to enter government through elections. “Now that we are in government, we have to greatly transform things and guarantee a complete change in the correlation of forces and of people's consciousness and defeat neoliberal ideology that causes so much damage to the country,” Pena said. The party's congress started on November 6, about 35 years since the party was founded. More than 1800 delegates participated. In July, the party held 303 assemblies nationally, with 10,627 participants, as the first in a series of debates leading up to the congress. FMLN-backed candidate Mauricio Funes was elected president in 2009, after defeating two decades of right-wing rule. Long-time FMLN leader Salvador Sanchez was elected president last year.